What Do We Mean By A Checklist? As per the definition of Hales et al; A checklist is an organized tool that outlines criteria of consideration for a particular process. It functions as a support resource by delineating and categorizing items as a list—a format that simplifies conceptualization and recall of information. Why Do We Need Checklists in Medicine and Dentistry? In Orthodontics, as in other dental and medical disciplines, the success of most procedures – from examination and diagnosis all the way to actual treatment and follow-up – largely depends on following certain determined protocols that have been scientifically validated as producing the best possible results, with maximum efficiency and reproducibility. 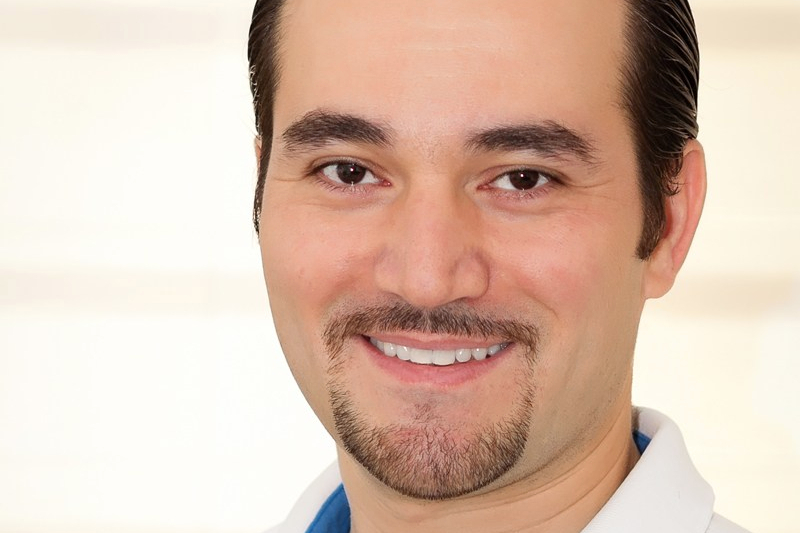 However, as medical and dental procedures are becoming more complex and lengthier by the day, even the most experienced clinicians can forget, miss or overlook certain critical steps in recommended procedures, to the detriment of the success of the intervention itself as well as the well-being of the patient. After all, we are all human. Precise, well-thought out checklists are a major valuable asset in improving our efficiency and ensuring we do not overlook important steps necessary for success of our interventions. The idea of implementing checklists in medical practice has been on the radar for a long time, and more recently, a number of systematic studies have been conducted in the medical field to determine whether the use of checklists can indeed improve overall success rates and reduce errors in medical interventions. The World Health Organization (WHO) has even published patient safety checklists that are recommended reading for all medical practitioners. The main findings of a systematic review of literature by Thomassen et al published in Acta Anaesthesiol Scand in 2014 have shown that the use of checklists resulted in improved communication, reduced adverse events, better adherence to standard operating procedures, and reduced morbidity and mortality. Another article published in the International Journal for Quality in Health Care has shown that Checklists have proven effective in various aspects of performance improvement and error prevention and management, and it provides some interesting and useful figures to demonstrate the quality of a good medical checklist. A good checklist should be based on a sequential, scientifically-sound flowchart of all procedural steps involved in a process, while considerations to its usability and effectiveness should also be taken into account. 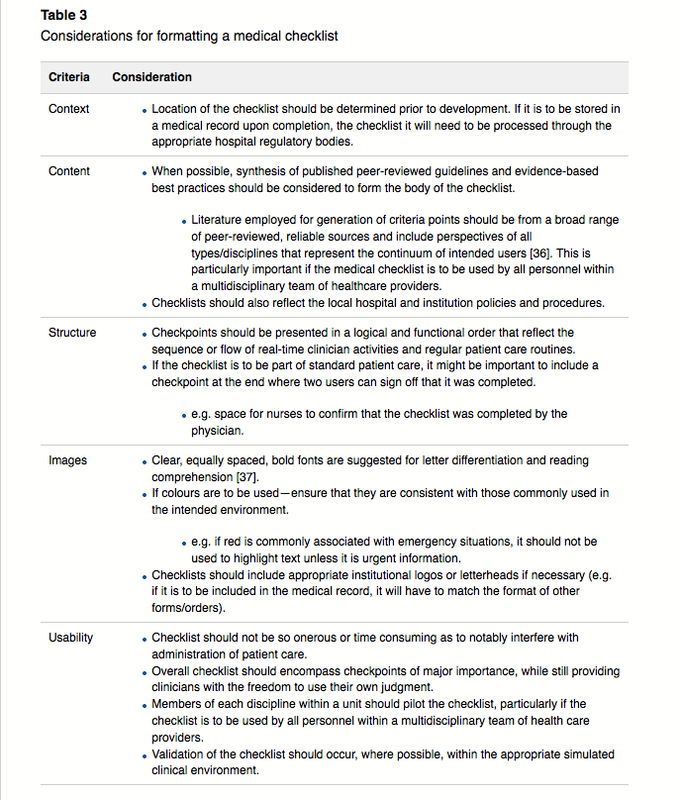 The following table from the above-mentioned article Development of medical checklists for improved quality of patient care by Hales et al clearly outlines the criteria for formatting a medical checklist. In orthodontic practice, checklists can be very helpful for processes such as Clinical examination and diagnosis of new patients, or for bonding procedures, or for joint orthognathic surgery planning, for example. One useful example – which I personally use for regular fixed appliance follow-up appointments – is a general checklist for the follow-up appointment to maximize efficiency and speed, while reducing errors and chances of overlooking important issues. This checklist idea highly correlates to the idea of “Systems Thinking” that I had discussed in a previous blog post. Here is an example clinical checklist for follow-ups in my orthodontic practice, as I personally perform them. The dental assistant has a separate checklist to ensure I – the clinician – can start the process outlined below. Patient greeted and seated, with apron and protective eye wear. Archwire adjustment or insertion of new archwires, along with any required auxiliaries for the current treatment stage. Progress clinical photographs (if needed). Informing patient/parent of overall progress and reinforcement of required instructions until next appointment. Detailing progress notes of current stage and next planned step for the next appointment in the patient’s electronic record file. Of course, there are reasons why there are 12 separate steps as well as why these steps are in this particular order, however these may differ considerably from one clinician to the other. Going through this particular checklist at every appointment really requires approximately 15-20 minutes per patient in most cases and ensures nothing is overlooked, especially in the haste of a hectic daily schedule. Such a checklist is only one simple example, but it highlights the advantage of having a systematic approach to recurrent daily procedures in order to increase speed and efficiency and reduce missteps, especially with repetitive daily tasks. This ensures that every patient receives the right kind of attention, sufficient time and ensures effective progress is maintained through the course of treatment. With daily repetition, these steps should become engrained in everyone’s mind and become second nature, yet having them in written form and constantly checked is a good recommendation. If you’re interested in an excellent read on the power of checklists, I highly recommend you read The Checklist Manifesto: How to Get Things Right by Atul Gawande. Next ›The 2nd Permanent Molars in Orthodontics: To Bond or Not to Bond? Great article! As a clinician I try to keep my patients appointments as padronized as possible, but in the chaos of a normal day that’s nearly impossible. Keeping a checklist nearby is a great way to minimize the changes in routine and try to maintain the focus on the most important person around, the patient. Thank you for the kind words. 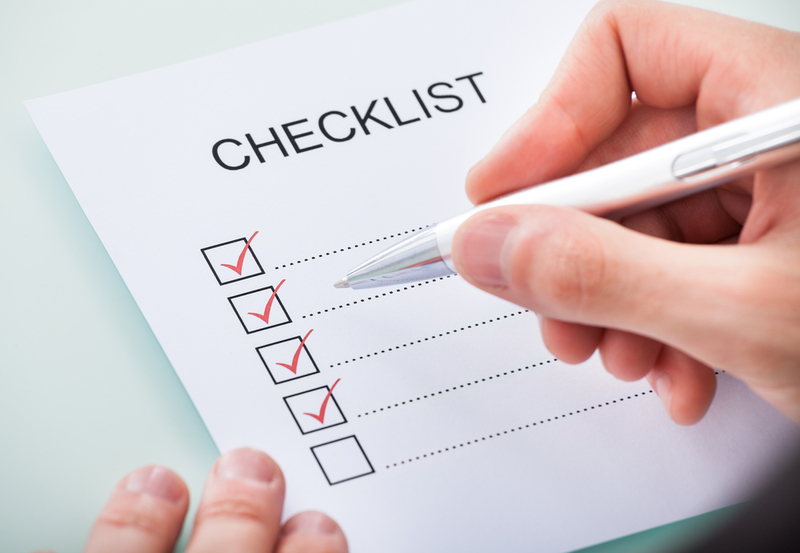 indeed, checklists are extremely valuable and one will realize that once one starts to use them on a daily basis. Thanks a lot for your valuable comment, and I would also like to congratulate you for you very interesting blog which I’ve started following recently (I use Google Translate to follow your posts as much as possible). Altough our target public is different, our goal is the same: sharing knowledge and information. Unfortunately I must stick to portuguese due to my readers being mostly from Brazil and with varied degree of education. But you are welcome if you want a better translation than Google’s for any post. Do you have any other checklists available for use in clinical practice that you would be willing to share? Thanks for your comment. There are several checklists that are quite specific to the way I do things at my practice, so they may not be directly relevant to all practitioners. However, I may now consider to write a follow-up to this post with more generally relevant examples, if that would be helpful to other colleagues. Please Stay tuned! And thanks again.